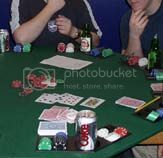 Last night I got together with some friends for a poker night. Danger! Red Alert! Yes, I know. I can recall sleazy gambling imagery too. Jenny was a bit dubious. Well, it cost only £10 to buy your chips so I consider it pretty cheap entertainment. The idea is to play for three hours and the person with the most chips wins 70% of the entire stake while the person with the second most chips gets 30%. There were eight of us playing so you can figure what there winner got. I should mention that I'm not the organiser - it's James's new found hobby. He's invested in a proper poker table, real chips and proper expensive poker cards. Serious stuff here! James does things the proper way. And he buys the pizza too (thanks James!). The game is Texas Hold'em. Except for James, we were all complete beginners so we had some practice time as we all learned the rules and proper poker etiquette. Then we played for real and I proceeded to lose all my chips. Well, I did all right in the beginning AND THEN lost all my chips but one. It will be no surprise to learn that James won in the end.